The DC-6 cargo plane departed Emmonak at 14:10 for a flight to Aniak. At 14:55 the no. 3 engine caught fire and the fire handles were pulled. The captain then ordered the propeller the be feathered. At 14:57 the first officer confirms that number 3 actually feathered, but said they were still indicating a fire. The captain then decided to carry out an emergency landing at Holy Cross. While the captain was preparing the airplane for landing the first officer stated that the fire is starting to go out. METO power was applied and the captain remarked that if the fire is out he would rather not land at Holy Cross. The fire warning bell sounded again at 14:59 and smoke began entering the cockpit. An approach was made to Russian Mission and the aircraft passed over the airport at 300-400 feet and was later seen turning to finals when the right wing folded upward. The aircraft rolled to the right and nosed down into the ground, short of runway 35. 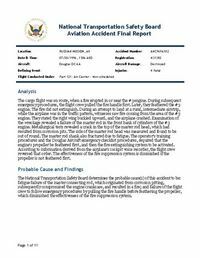 PROBABLE CAUSE: "Fatigue failure of the master connecting rod, which originated from corrosion pitting, subsequently compromised the engine crankcase, and resulted in a fire; and failure of the flight crew to follow emergency procedures by pulling the fire handle before feathering the propeller, which diminished the effectiveness of the fire suppression system. " Distance from Emmonak Airport, AK to Aniak Airport, AK as the crow flies is 287 km (180 miles).